I get it. Social Media is the equalizer of all things sales. It enables us to have access to anyone we want. Everyone is just a tweet away or DM away. That doesn’t mean that EVERYTHING about sales is a shortcut. You still need to give value. You still need to build a relationship. Especially in B2B where relationships are everything. I’ve been communicating and selling on social since social networks were born. And I’ve seen some doozies as far as outreach is concerned. 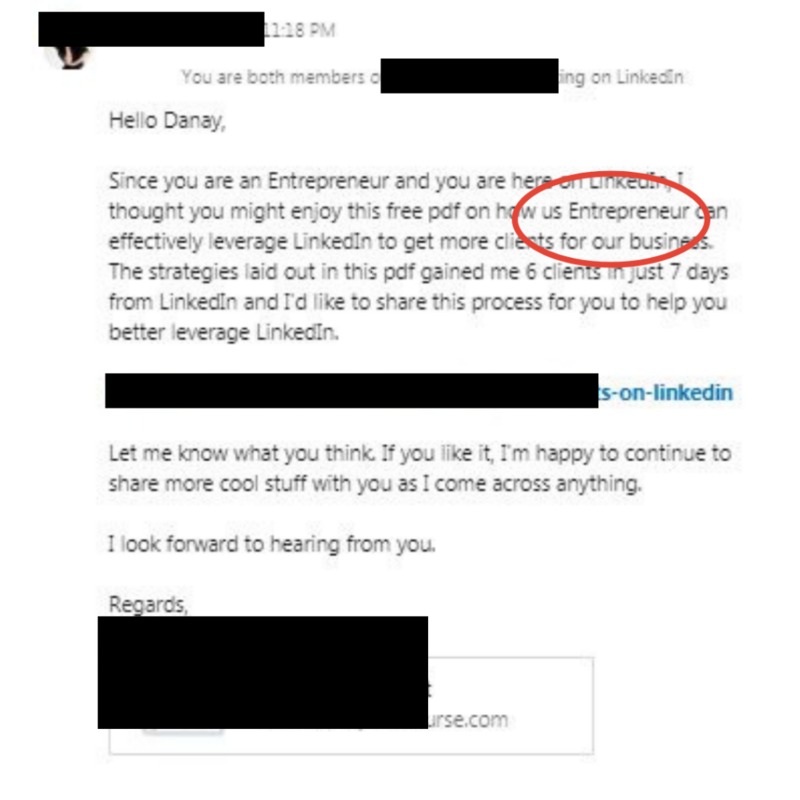 Here are some of my favorite fails from folks reaching out on LinkedIn. Out of all the outreach emails, texts and DMs I receive daily, my favorites are the canned ones like the one above. They are possibly using an automated program to mass send a message in the hopes that someone will bite. If they are doing this manually, that’s even worse. It’s also a huge waste of time and effort. Ten messages to prospects that are personalized and well researched will outperform 1,000 mass ones any day. Take time to get to know your prospects and mention something you like about their company or their work. 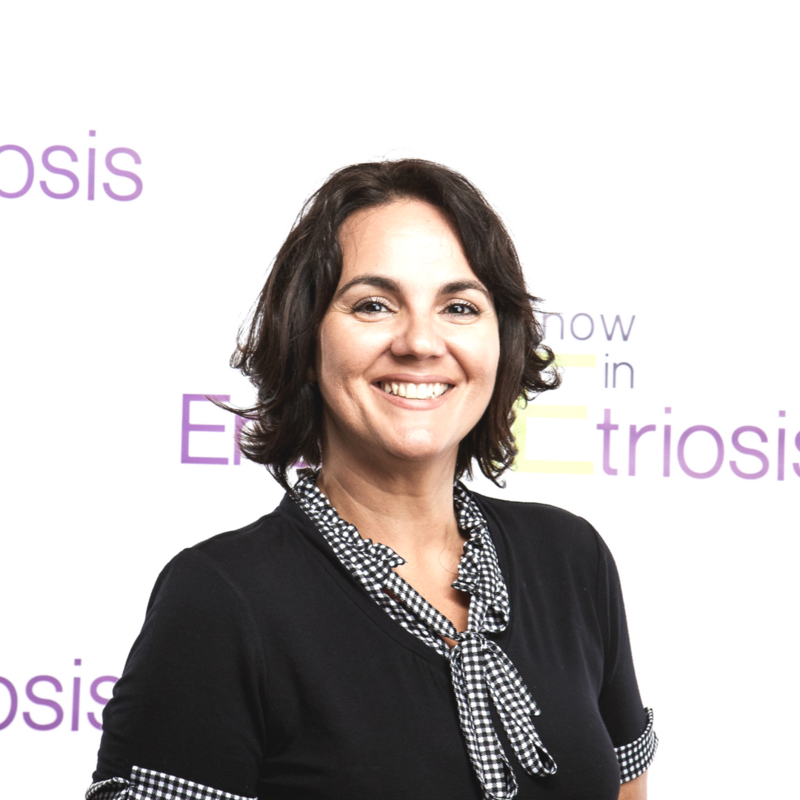 Something to the effect of, “Hi John, I love what ABC Corp is doing with women’s empowerment and I would love to connect and learn more about you and how we can possibly collaborate.” Then you can follow it up with a call-to-action. This isn’t a hard sell, because social outreach is just not the place for it. I’m sorry folks. There is just ZERO excuse for bad grammar in business outreach. There are a bazillion applications that will check your grammar for you. It is simply unprofessional. I know we all have templates we work off of for our outreach. That’s normal. What’s NOT OK is forgetting to make sure you at least change the name of the person when reaching out. This is usually an immediate delete. This tells me that this person is careless and lacks attention to detail. Would you want that person to handle your account? Here is a great example of a well done outreach. He first connected without any selling whatsoever. He then followed up with something of value, again, no selling. Later, after we established a relationship, we had a discovery call and continued from there. Even if it didn’t turn into a sale, we now have a relationship where he can freely reach out to me where I am open to what he has to say. My only criticism here is that he didn’t personalize it to me. I know it was canned, but I bit anyway because it was not an effort to hard sell. Instead, it was an attempt at simply connecting, giving, and building from there. I have hundreds of examples just like these across many social networks. None of the hard sells, bad grammar or wrong names get answered. The lesson here is to take your time to learn about your prospects, check your grammar and be meticulous. This is your first impression, so make it count. How do you respond to these types of messages? I usually just delete them and they are out of my mind. Really bad form to not have the correct name or misspell words in the form letter. There is spell check click the button. Oh man, yes, I hate getting random canned emails. I’ll get random DMs and I’m like, “Huh?” Or I’ll get messages on Instagram asking me to join their team, which is so tacky. I usually hit the delete button when I receive those type messages and emails. The ones that really get me are the ones who call you by the wrong name. 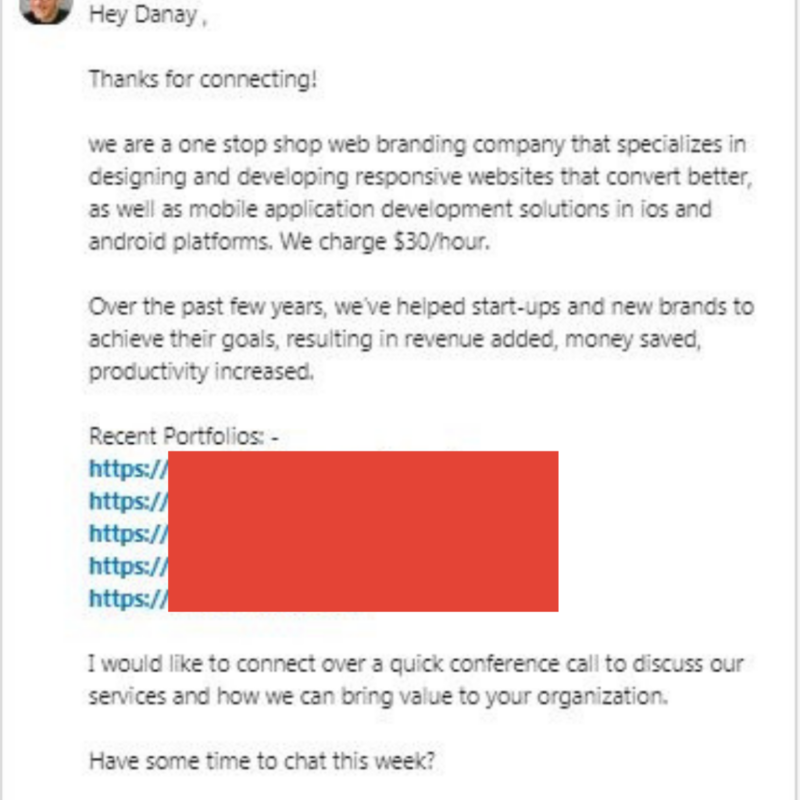 I received an email yesterday promising to “fix my website” and they didn’t even bother to change the name from the previous blogger they had contacted. Delete! These are all great business tips. People like to see you pay attention to detail and getting the spelling and grammar right is so smart. I guess its just me but I love the tweets that are a quick read. Twitter moves so fast!! Grammatical and spelling errors are huge red flags for me. I love to support new businesses but sending me a message riddled with errors never makes a good 1st impression. So much business and networking happens via social media nowadays. These are eye-opening fails and important reminders to keep in mind as we all navigate online outreach! I do all of my business communication via email and ignore most of the inquiries I receive through social media. My email address is easy to access, so being contacted another way shows me that person did not pay attention. Still, I have encountered all of the outreach situations you mentioned above. I agree with you 100%. I get them all the time with the wrong name or even Dear Blogger – drives me nuts. I literally just delete. It can be such a waste of time. Canned emails really bug me. Especially when they don’t get my name right or anything! Oh my goodness! 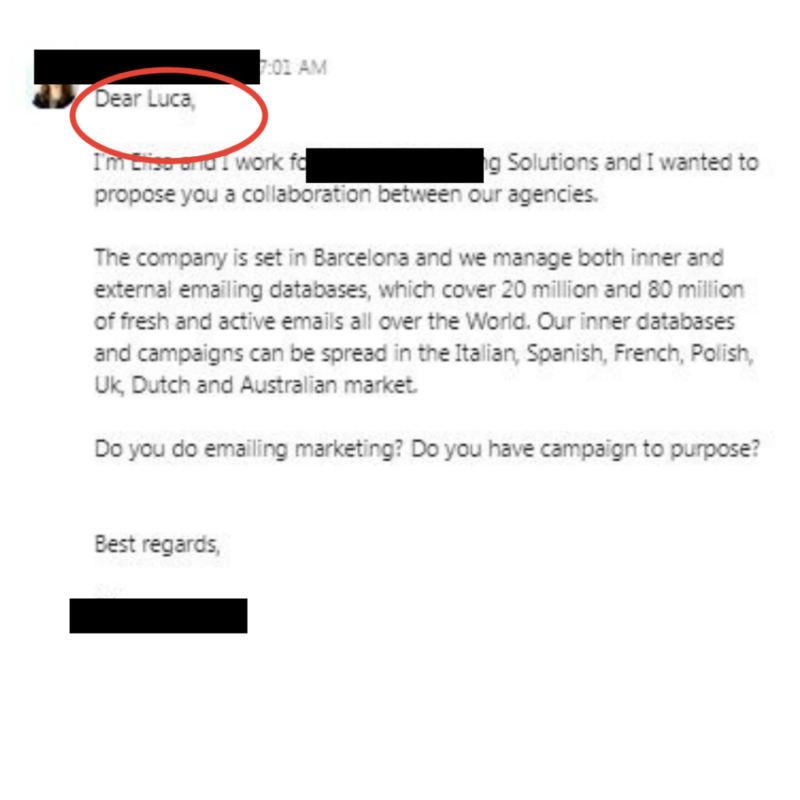 Putting the wrong name in an outreach email?! That is SO highly unprofessional – I have never run into a case like that but I’m not surprised that it happens. I also encounter receiving a message but with a different name. The body of the email is so good but that wrong name gave me a little not so good impression from the sender. Some of the stuff people have done is quite comical. Sad to say, I myself have been there! It’s amazing that we get these kinds of e-mails! Sometimes I also get “Dear ,” where they forgot to write in my name. All of those situations have happened to me. I just disregard them. Such a useful post! 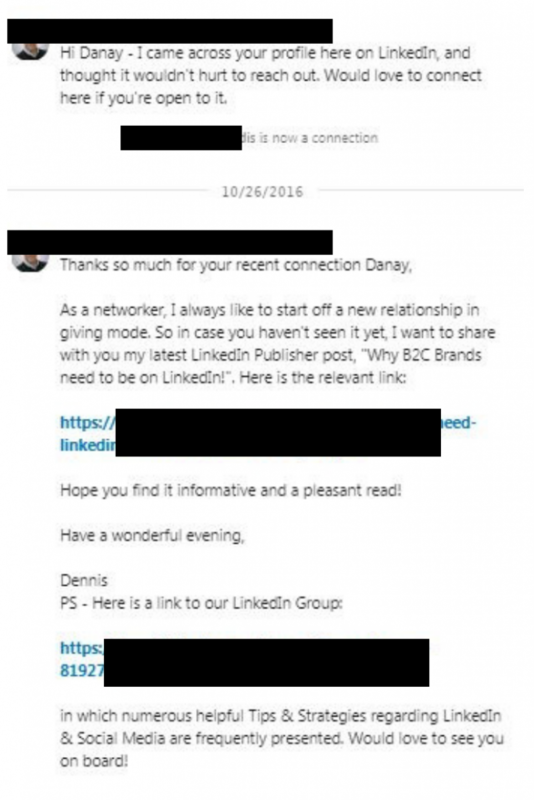 I don’t usually communicate with companies via LinkedIn or social media. Good grammar is definitely a must when sending out communication. I get stuff like this a lot and I don’t even read them anymore. Oh these are my pet peeves, too. The other one I hate is that they claim to just “love” my website, but call me Dear “website name” and not my name, which is written clearly on the sidebar with my photo. I’m at a point now where I dread checking my DM’s. I know that reaching out to future clients is important, but it just feels like spam that I can’t avoid. Your second example is so refreshing in comparison.